NO CHARGE 90-DAY POWERTRAIN LIMITED WARRANTY. Plus 12 Months Roadside Assistance. See dealer for more details. 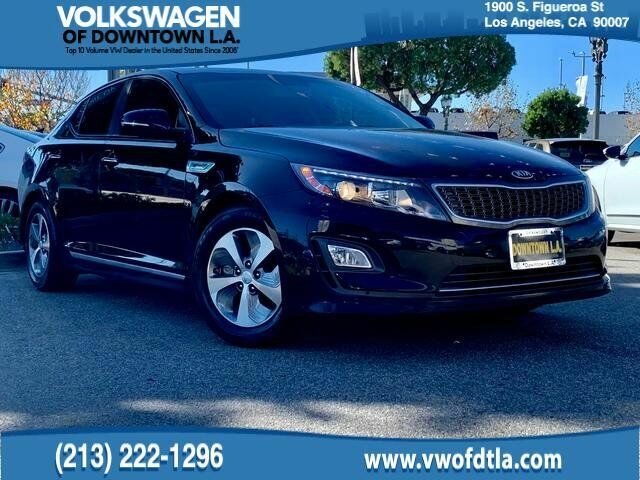 Aurora Black 2015 Kia Optima Hybrid EX MULTI POINT SAFETY AND MECHANICAL INSPECTION PERFORMED BY CERTIFIED TECHNICIAN, FRESH OIL CHANGE, NEW WINDSHIELD WIPERS, Bluetooth Hands Free, FUEL EFFEICENT, GREAT COMMUTER CAR, Optima Hybrid EX, 2.4L I4 MPI Hybrid Electric DOHC, 6-Speed Automatic with Sportmatic, Aurora Black, 6 Speakers, ABS brakes, Alloy wheels, Electronic Stability Control, Exterior Parking Camera Rear, Front dual zone A/C, Heated & Ventilated Front Seats, Heated door mirrors, Heated front seats, Heated rear seats, High intensity discharge headlights: Xenon, Illuminated entry, Infinity AM/FM/CD/MP3 Audio System w/Navigation, Leather Seat Trim, Low tire pressure warning, Remote keyless entry, Security system, Steering wheel mounted audio controls, Traction control, Turn signal indicator mirrors, Variably intermittent wipers. CARFAX One-Owner. 36/40 City/Highway MPG FWD 2.4L I4 MPI Hybrid Electric DOHC 6-Speed Automatic with Sportmatic Clean CARFAX.